Now that we’ve explored each of the cards in Chase’s Ultimate Rewards ecosystem individually and in depth (see our guides to the Sapphire Reserve, Sapphire Preferred, Freedom, Freedom Unlimited, and Ink Business Preferred), we’re going to discuss the value of holding multiple or all of them. When used in concert with each other effectively, there’s no greater return on your spending. When it comes to rewards credit cards, most people assume that a point is a point, and thus getting 2% back on one credit card is equal to getting 2% from any other card. This is completely false. Almost nothing is equal across rewards programs. The value of credit card rewards points, the value of travel loyalty program points, how those points are valued when redeemed through a travel portal, which transfer partners are available for those points, and what those transfer ratios are are completely different across different cards and programs. The best ways to redeem Ultimate Rewards points are by transferring them to one of Chase’s 13 travel partners, or by redeeming them through Chase’s travel portal, where holders of the Sapphire Preferred can book basically any flight, hotel room, or rental car at a rate of 1.25 cents per point, or 1.5 cents per points for Chase Sapphire Reserve customers. Ultimate Rewards points never expire, can easily be consolidated between your cards to be redeemed using the increased Sapphire rates, and can even be combined between family members and spouses who aren’t on the same account. It’s not hard to find a $100-$150 hotel room that you can book for 5,000 points through Hyatt’s loyalty program (a value of 2-3 cents per point), or a Southwest flight valued at 1.5-2 cents per point. If you get really exotic, you can find even more value by, say, booking Alaska Airlines flights with Singapore Air KrisFlyer miles that you transferred from Chase, or an American Airlines flights with British Airways miles. The value of those points will vary considerably based on how you spend them, but they’re almost always worth more than $.01 each. Do not use your points for a statement credit, on Amazon, for online shopping, or to buy gift cards. We’ll be putting together more roundups of the best ways to redeem your points, but you will need to do your own research to get maximum value, and if you’re not willing to, it may make more sense to stick with a straight cash back card. Reserve: 50,000 points after $4000 in the first three months. Preferred: 60,000 points after $4000 in the first three months. Freedom: 15,000 points after $500 in the first three months. Freedom Unlimited: 15,000 points after $500 in the first three months. Ink Preferred: 80,000 points after $5000 in the first three months. Each card also frequently offers referral bonuses that you should do your best to take advantage of. While the rotating five percent categories of the Chase Freedom will net you point windfalls, it cuts both ways. You may find yourself only earning 1.5% back on groceries with your Freedom Unlimited for nine months of the year for example. 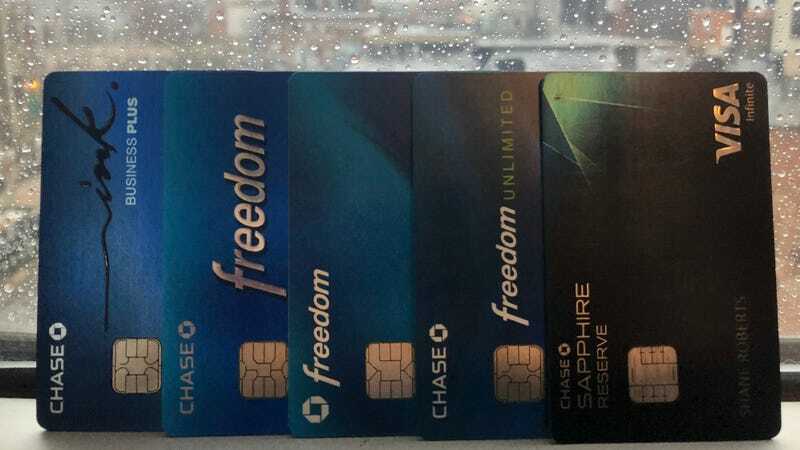 The quarterly Chase Freedom bonus caetgories are limited to the first $1500 in spending, but it is possible to have more than one Freedom card, more on that below. The Ink Preferred bonus categories are limited to the first $150,000 in spending per year. The Apple/Chase/Samsung/Paypal category is amazingly versatile. 5% back at any merchant who takes those payment methods. On a basic level, the 5/24 rule suggests that anyone who has gotten 5 or more new credit cards in the past 24 months will automatically be rejected on any new Chase card applications. The rule is not ironclad and there are certain credit cards it does not take into account in its calculations, including both Chase cards and cards from other banks. However, it does appear to count every Ultimate Rewards card and is definitely something to keep in mind. The other big factor here is that there is no reason to hold both the Sapphire Reserve and Sapphire Preferred simultaneously, and in fact, Chase implemented a new rule in August 2017 that requires you wait two years between Sapphire sign-ups. For regular travelers, we obviously think the Sapphire Reserve is well worth holding, but you should make your decision based on which card you want to end up with. If you decide to for both Sapphire sign-up bonuses, once the two year limit has passed, you can “downgrade” your first Sapphire card to a second Freedom to boost your rotating quarterly 5% bonus ceiling to $3000. Primary rental car insurance from the Chase Sapphire Preferred, Sapphire Reserve, and Chase Ink Business Preferred. If you have the Sapphire Preferred, you can invoke your benefit for a 12+ hour delay, or any interruption requiring an unplanned overnight stay. On the Reserve, that threshold drops to six hours. Both cards will reimburse up to $500 in reasonable expenses for the cardholder, the cardholder’s spouse or domestic partner, and any dependent children under age 22. Finally, the delay must leave you stranded away from home, so you can’t expense meals in your hometown if your outgoing flight gets delayed overnight. A $100 credit to cover the application fees of Global Entry or TSA Pre✓, Priority Pass Select Membership which gets you in the door of more than 1000 airport lounges, elite status at multiple car rental services, and more from the Sapphire Preferred. Cell phone protection from the Ink Preferred, which covers three claims/year of up to $600 in damage with a $100 deductible per claim, including phones of your employees. The Chase Sapphire Reserve has an annual fee of $450 that’s immediately chopped down by an annual $300 travel credit that applies to every travel related expense you can think of. While you should have no trouble offsetting the remaining $150 of the fee with the Reserve’s massive earning potential, the card’s primary rental car coverage should be easily worth that much to anyone regularly renting cars. If you do some quick math, it’s entirely possible the return on your monthly Internet and cable bills alone will negate the annual fee of the Chase Ink Preferred, which is great if you’re someone who doesn’t really have a business but wants this card. My single favorite credit card perk is the three Gold hotel statuses I get with my American Express Platinum, and obviously it would be amazing if Chase did something similar with the Reserve. Chase has an Amazon card that earns 5% back on... Amazon. That card getting rolled into Ultimate Rewards is truly the dream.